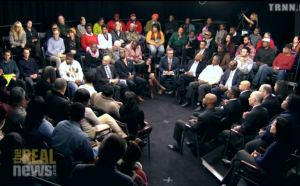 Baltimore Town Hall: Should The Community Control The Police? Listen to a special 2-hour broadcast of excerpts from a town hall meeting I moderated Wednesday night at the Real News Network, on the role of the community in the Police Department. 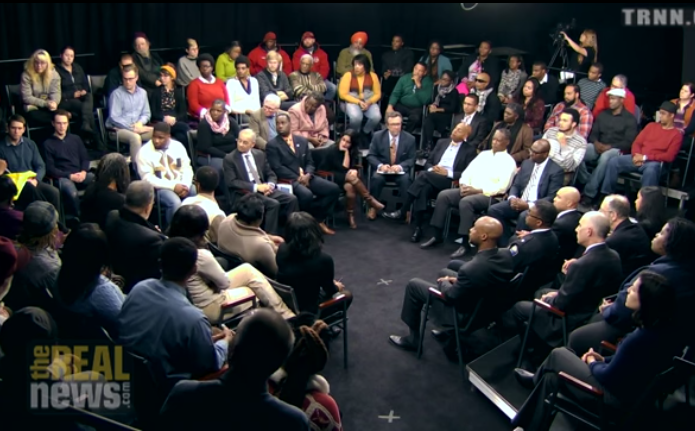 The panel and the audience – including representatives from the Baltimore Police Department, public officials, activists and community members – debated and discussed the issues and possible solutions. Included in the discussion were: the ACLU’s Sonia Kumar; community activist Kim Trueheart; Adam Jackson of Leaders of a Beautiful Struggle; Chief of the Baltimore Police Department’s Community Partnership Division Lt. Col. Melvin Russell; criminal defense attorney J. Wyndal Gordon; former Black Panther Marshall “Eddie” Conway; Baltimore County Police Department Lt. Jeffrey Shorter; Alok Mukherjee of the Toronto Police Services Board; and Dr. Ray Winbush of the Institute for Urban Research at Morgan State University. Click here to see a transcript of the town hall and the full-length video of the event.